Clubs were off to a fast start in July with events, fundraisers, service projects and planning meetings. Thanks to the five clubs in Area 4 (Northwest Valley) for inviting me to their Celebration Dinner. It was my first official function as D5495 Governor and what a treat it was getting acquainted with so many Rotarians in a social setting! Witnessing the synergy between the Presidents, Immediate Past Presidents and Presidents-elect from five clubs was amazing—talk about continuity of leadership! 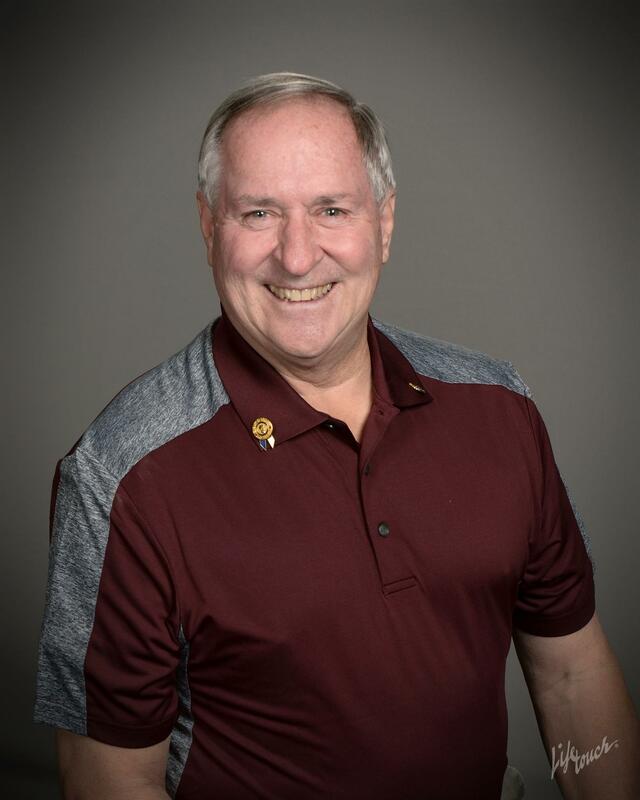 Past District Governor of D5510, Glenn Smith passed in his sleep last night from heart failure. PDG Glenn had been going through many abdominal surgeries and was in a recovery hospital in Phoenix. Unfortunately his heart just couldn't take it. He will be missed. 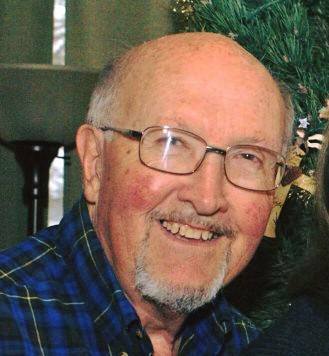 He was a member of the Payson Rotary Club. Glenn's wife Sherry, their daughter and son, wanted to thank everyone for their good wishes and prayers. 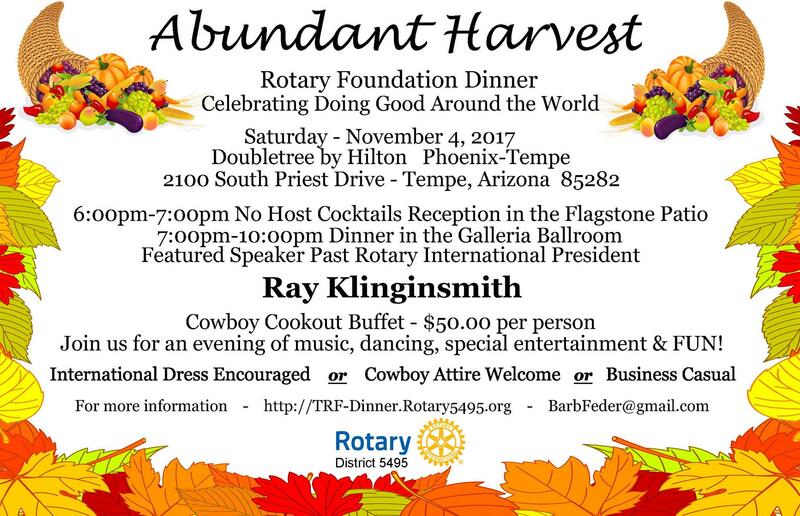 The Area 4 Rotary Clubs, Sun City, Sun City Del Sol, Sun City West, Surprise and Wickenburg have been blazing new trails for the last Rotary Year in many ways. The five club Presidents, Presidents-elect, Presidents-nominee and Assistant Governor meet monthly. We rotate the meeting place using the presidents homes or restaurants. We always meet on the same day and the same time that way it becomes a "standing meeting" monthly. 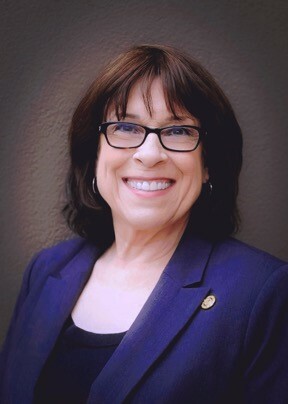 The meetings are used to discuss current Rotary business, club projects, district projects, international projects, and club situations which can benefit from a "round table" discussion. 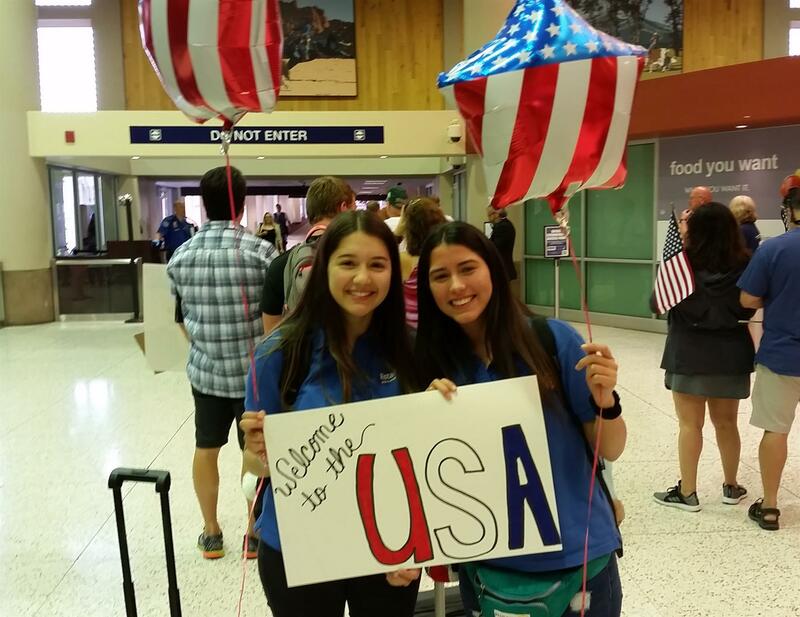 Here are some arrival photos of the 2017-2018 D5495 Inbound Chilean Rotary Youth Exchange Student Ambassadors, Xiomi (to Buckeye) and Vale (to Scottsdale). They were met at Sky Harbor Airport by our volunteer RYE Rotarians, Rotex, (previous exchange students), and Host Families after a very long flight from Santiago. Both girls departed Chile in the middle of a very cold, dry winter and arrived in Phoenix during a very warm, humid, summer. The Microcredit Projects in Hermosillo, Mexico, continue to be very successful. The two Global Grants in Hermosillo, administered by our Micro-Finance Institution (FinReg), have now been closed by RI. They continue to perform well and exceed our long term goal of 97.5 percent collection; over 85 percent of the borrowers are women, and many are single mothers. We will continue to report the Microcredit Mexico activity on a Quarterly basis. Buffett's simple yet thoughtful quote conjures the image of one of life's simple pleasures and, indeed, of one of our most important natural resources— trees. 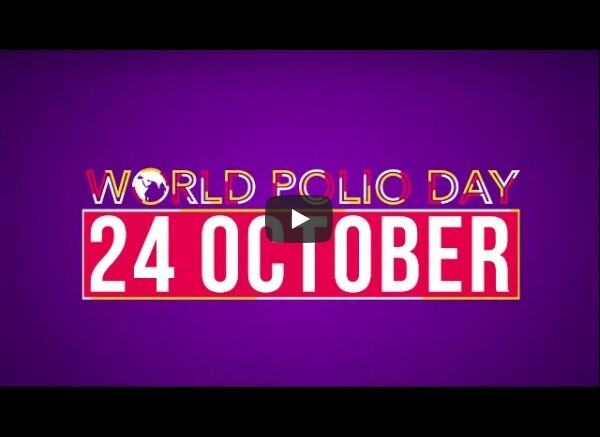 It conveys our connectedness and the importance of positive action to enhance the lives of others and communities. Moreover, to me, it suggests the need for vision, forethought and sustainability. Greetings from the District 5495 Rotary Foundation Committee (DRFC)! Now that D5510 and D5490 are officially merged, we are working to step up communications from our committee. 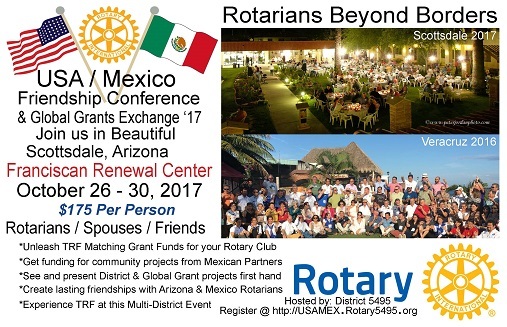 Please visit the information on the new D5495 website: www.Rotary5495.org. Go to the Rotary Foundation tab at the top of the page and, by scrolling your courser over the sections in this tab, you can find the most useful guides, forms and links. Except for links, all these can be downloaded into PDF. Contact information for our team is under Team Roster. Additionally, you will find the Rotary Foundation Guide, a link to TRF Resource Guide, Recognition Opportunities and the Rotary (Foundation) Contribution Form. The Grant sections provide general information and details about District Grants and Global Grants. 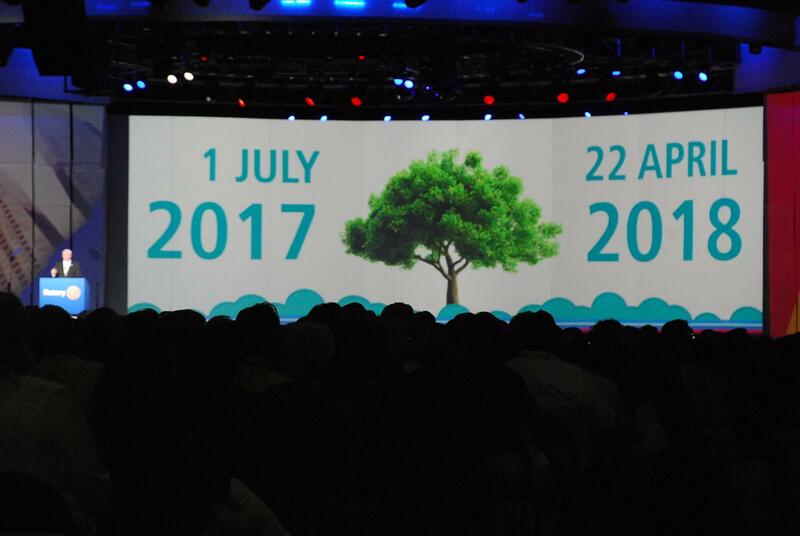 There will be some additional information added to the Rotary Foundation tab over the next month to help you find international projects, TRF speakers for a club program and more. Our committee is here to serve clubs and club members! Please contact us for any assistance you need with The Rotary Foundation or grants! 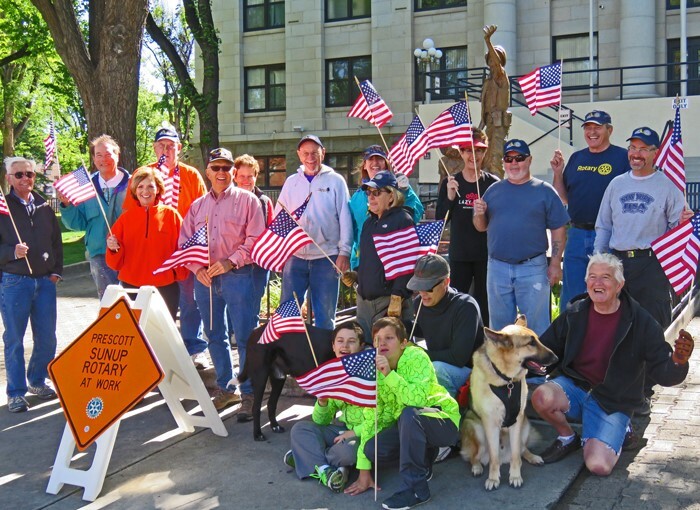 The Prescott Sunup Rotary Club once again gathered at the Prescott Courthouse Plaza in the early morning hours to provide their annual renovation of the All Veterans’ Memorial statue and the surrounding garden. The statue, erected by the Yavapai Vietnam Veterans Association, portrays a Marine stretching one arm to the sky as he shouts for a medic, while clutching a wounded Marine at his side with the other arm. Tony Shaw, a fellow Sunup Rotarian and Vietnam veteran, performed the dedication at the 1989 unveiling ceremony. RYLA 5495 Pinerock (which was 5490) will be held January 12-15 in Prescott. RYLA 5495 Pinetop (which was 5510) will be held in April 2018. Details on each will be coming as the dates approach. The Rotary New Generations Service Exchange (NGSE) is a short-term (one-to-six months) cultural and professional exchange for college students and young professionals 18 to 30 years old.